Much ado is being made about the drop in the NFIB small business optimism index. While interesting, this index is just one part of the larger NFIB Small Business Economic Trends survey that contains a trove of other information. In fact, a little digging into this survey can shed some light on the nature of the ongoing economic slump. 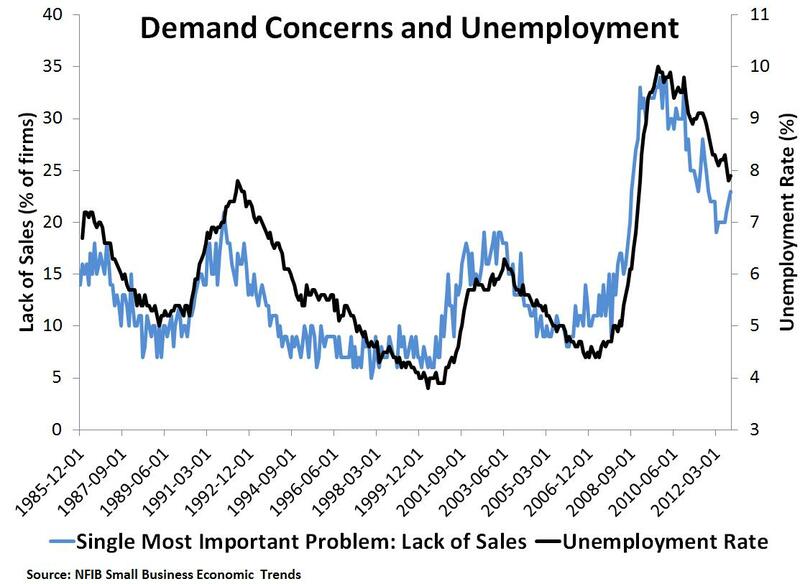 This is because the survey asks firms what specific developments they see as the "single most important problem" they face. This question, in my view, is the more important than the news-making small business optimism index because it tells us why firms feel more or less optimistic. Knowing this information better informs what the appropriate policy response should be to the ongoing slump. Unfortunately, it rarely makes the headlines. This post is an attempt to correct this shortcoming. So what does this survey show for this question? There are a number of answers from which firms can chose. Below is a graph that shows some of their responses. Other responses included concerns about inflation, financing costs, insurance availability, and the threat of competition. They were not viewed by firms as being very important. The concerns with the highest scores are shown in the above figure: lack of sales, taxes, and regulation. 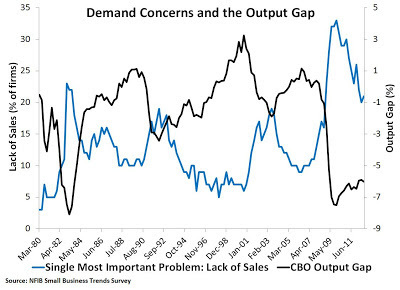 Over the past four years, lack of sales has been the most vexing problem for firms. 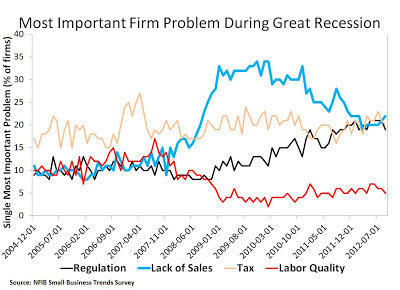 Taxes have always been relatively high, while concerns about regulation have grown more important over this period. So what does this tell us about the nature of the ongoing slump? 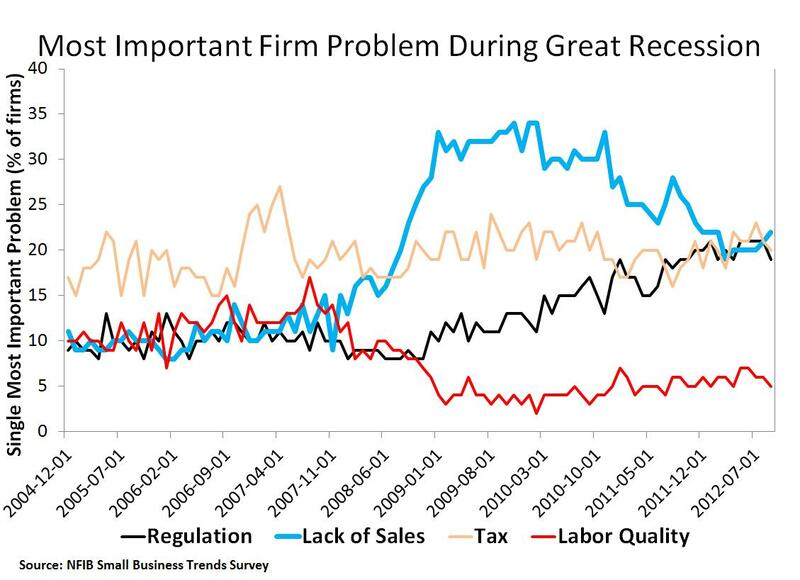 The figure indicates that a lack of sales, independent of concerns about regulation and taxes, has been the biggest fear for small firms up until recently. If so, one would expect (given sticky wages and prices) firms would cut back on production and employ fewer workers as result of the expected weak sales. Is there anyway to corroborate this view? 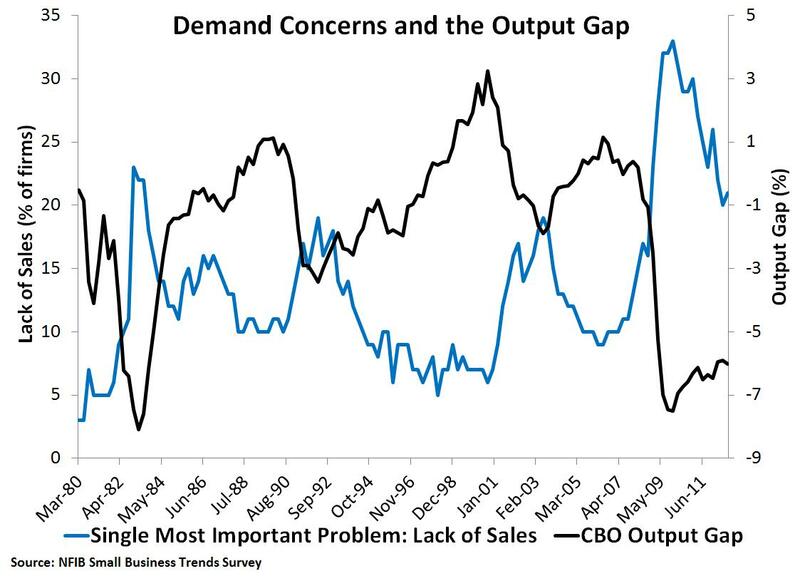 Yes, the CBO output gap leaves much to be desired, but the fact that it tracks sales concerns relatively closely (R2=54%) indicates there is something going on here. The easiest explanation is that expected weak sales led firms to curtail production. This is not conclusive evidence, but is suggestive that there has been a shortfall of aggregate nominal expenditures. Put this together with the shortage of safe assets problem (or equivalently, the risk premium is too high problem) and its hard not to view the current slump as being something that could be largely solved with the appropriate monetary policy response. So yes, the deeper secret of the NFIB is that we need the Fed to adopt an explicit, rule-based NGDP level target.